I think this is one of my favorite Italian dishes. When I need a pasta fix, this is my go to recipe. There are so many versions of this dish, but I personally like my version because it is basic, rich, very good, but not overwhelming. 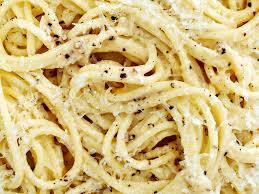 Cacio e Pepe translates as "cheese and pepper" and hails from Rome. In its most pure form it is made with only pasta, Romano cheese and black pepper. I've adjusted my version to include Parmesan and butter. I previously posted a vegan version of this classic dish, but wanted to pass along my original version as well. Traditionally this dish is served with a long thin pasta, but I have had it with penne and rigatoni and it’s also very good with these pasta shapes. 1 lb Spaghetti, Rigatoni or Penne. 1/4 tsp Sea Salt. Adjust as desired. Remove your butter from the refrigerator and grate your cheese. You do not want the ingredients to be too cold, or they will not create a smooth sauce. Start the water for the pasta, salt the water and once you put the pasta in the pot, combine all remaining ingredients into a bowl and create a paste. About half way through cooking the pasta, take a Pyrex measuring cup and dip out about 3/4 cup of the boiling pasta water and set it aside. You don't want it to be too hot, or it tends to make the sauce lumpy. Cook the pasta very al dente, so it needs an additional 2 minutes of cooking. You will finish it in the pan. Drain the pasta, add it back to the original pan on low heat and add the paste and reserved pasta water a bit at a time, stirring until it is all absorbed and the sauce is very creamy. You don't want it to be watery, so don't feel that you need to use all of the water. Serve immediately with additional cheese as desired.